What if several of the world's biggest food crops failed at the same time? Less than one-quarter of Earth's total cropland produces nearly three-quarters of the staple crops that feed the world's population – especially corn, wheat and rice, the most important cereal crops. These areas are our planet's major breadbaskets. Historically, when a crop failed in one of these breadbaskets, only nearby areas had to contend with shortages and rising prices. Now, however, major crops are traded on global markets, which means that production failures can have far-reaching impacts. Moreover, climate change is expected to generate heat waves and drought that could cause crop losses in most of the world's breadbaskets. Indeed, failures could occur simultaneously in several of these key regions. In the past several decades, many of the world's major breadbaskets have experienced shocks – events that caused large, rapid drops in food production. For example, regional droughts and heat waves in the Ukraine and Russia in 2007 and then again in 2009 damaged wheat crops and caused global wheat prices to spike by substantial amounts in both years. 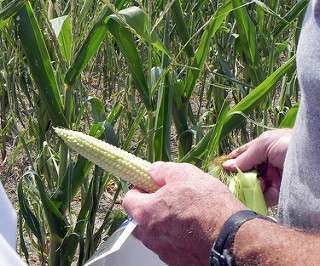 In 2012 heat and drought in the United States slashed national corn, soybean and other crop yields by up to 27 percent. And yields of important food crops are low and stagnating in many countries due to factors including plant diseases, poor soil quality, poor management practices and damage from air pollution. How can we understand this risk and its potential consequences for both rich and poor nations? Programs already exist to provide early warning of potential famines in the world's poorest countries, many of which already depend heavily on food aid. There also are programs in wealthier nations that monitor food prices and provide early warnings of price spikes. But these programs focus mainly on regional risks, and often are not located in major food production areas. Very little work has been done to analyze risks of simultaneous shocks in several of the world's breadbaskets. We want to understand the impacts that shock events could have if they occur in the real world so that we can identify possible contingency plans for the largest-impact events. In order to do that, we have used an integrated assessment model, the Global Change Assessment Model, which was developed by the U.S. Department of Energy and is freely available to users around the world. Integrated assessment models have been designed specifically to simulate the interactions among Earth's energy, economic and land use systems.